The Scientific Registry of Transplant Recipients (SRTR) is the national database of statistics related to transplantation. Information is collected from every Transplant program in the United States. The SRTR provides information about transplant outcomes. Their reports include information concerning patients on the waiting list, those who receive a transplant and donors. Patients and their families can also learn how these statistics differ from one transplant program to another. The SRTR outcomes take into account how sick the patients are at each individual transplant center. This is called the "Expected" outcome. The number is different from center to center depending on the characteristics of the patients each transplant center lists. 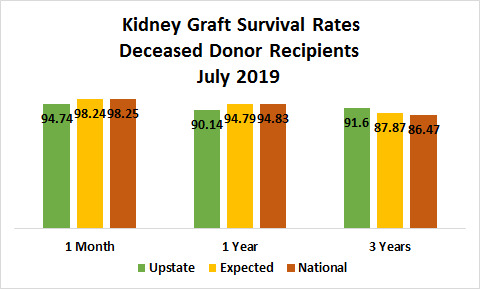 The "Expected" outcome is what the SRTR "expects" the outcomes to be for each transplant center based on their unique patient population.The "National Average" provides the average graft and patient survival for all kidney programs in the country. 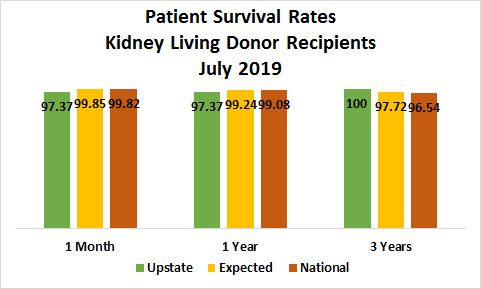 The following tables highlight the most recently published outc omes for one-month and one-year time frames for the kidney transplant program at Upstate. The percentage of patients who are still alive after transplant is referred to as "PATIENT SURVIVAL". The percentage of transplant organs that are sill working after transplant is referred to as "GRAFT SURVIVAL". The percentage of transplant organs that are still working after transplant is referred to as "Graft Survival." The percentage of patients who are still alive after transplant is referred to as "Patient Survival." The following 2 graphs represent the SRTR data for patients who receive a living donor graft. The data presented above represents patients who received a deceased donor graft. The information can be applied the same as noted above on patient and graft outcomes. The SRTR provides information about transplant outcomes. 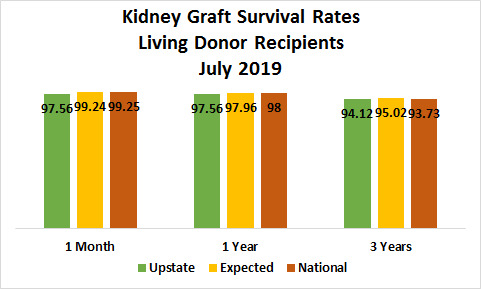 Upstate's living donor patient and graft survival rates are not statistically significantly different from the expected rates. 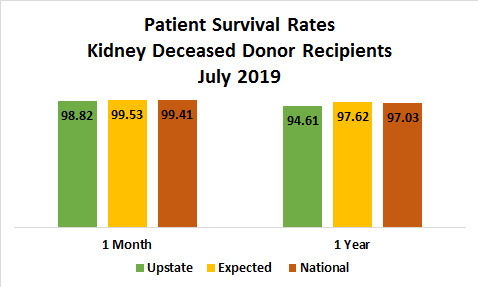 Data source: www.srtr.org for patients receiving a Kidney Transplant between July 2014 and December 2016.